I don’t know about you, but I always hit this time of year and find myself amazed at how quickly the year has gone, and yet, how much has happened in that time. A year can bring so much change. For me, this one has—and that is just as true for my writing career. I find myself completely able to go in any direction for the first time in a few years and that’s both freeing and very scary. Speaking of changes; today is my last day as an official member of the Inspy Romance blog. I’ve enjoyed my time here and have loved interacting with everyone. I’ve been blessed to be a small part in this wonderful blog this year and wish everyone the best. Gifts of Love and Manuscripts & Mistletoe – both by Carol Moncado. If you’re a fan of Carol’s books that take place in Serenity Landing (and who isn’t??) then you don’t want to miss these sweet Christmas novellas about teachers in her lovely fictional town. This is the third book in the Lone Star Cowboy League: Boy’s Ranch series – but you don’t have to have read the first two in order to love and understand Lee’s gorgeous book. However, if you did read my book in the same series, The Ranger’s Texas Proposal, then you’ve meet the hero in Lee’s book! Have you started Belle’s Alaskan Grooms series? If not, do yourself a favor and read them because the town of Love, Alaska and the people who live there are absolutely wonderful and are so much fun to read. I’ve been avidly awaiting the release of this book because we’ve meet the hero in prior ones and I couldn’t wait to see what the story would be. It’s good, guys. So good. Do you have a watchlist full of Hallmark movies? Then this novella collection is exactly for you. Fun, witty, and lovable characters make you feel like you’re in the middle of a made-for-tv love story in the most believable ways! Six brand new Christmas novellas for only 99 cents – this bundle is enjoying its second month of being a bestseller on Amazon. My story in the collection, It Was You, launches a new novella series that will continue into next year. With that I wish you cozy late nights, warm blankets, good books and endless hot chocolate in the weeks to come. Thank you for letting this space on the internet be a fun and encouraging one and for allowing me to enter here this past year. I wish you all well and Merry Christmas! 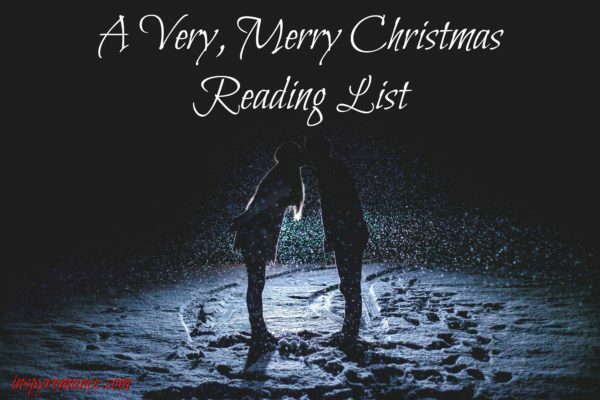 Let’s talk about your favorite Christmas movies and books. Are you a Hallmark follower like me? Which of their new movies are you most looking forward to? What’s your favorite of the old Christmas movies? A coffee drinker, avid reader, and chocolate aficionado, Jessica is multi-published and writes sweet romance for Love Inspired. She holds degrees in both Communications and Biblical Studies and has worked as a zookeeper, a librarian, camp counselor, horse wrangler, housekeeper, and finance clerk, but now loves her full-time work in municipal government. Jessica and her family live in the Midwest. Sorry to hear you won’t be posting any more:( Maybe you will do guest appearances sometimes…? My youngest son just finished his first year at school- wow, how quickly that has gone! We don’t have Hallmark Chanel here, but there is an old Australian Christmas movie that I love called Bushfire Moon. I used to watch it when I was a kid, now I show my boys in the lead up to Christmas. We also love watching The Polar Express, and I enjoy Love Actually and While You Were Sleeping. I’m sorry to hear you’re leaving us Jessica, but wish you the best in your writing endeavors. Oh yes, I love to watch the Hallmark Channel, especially their Christmas line-up. A couple of my favorite older Christmas movies are White Christmas and While You Were Sleeping. Enjoy your family and reading time! Wishing you and your family a Merry Christmas. A Very, Merry Christmas to you too. We’ll miss reading your posts here (hopefully you’ll come back at least as a guest). I really enjoy Hallmark movies when I don’t have much to do, but I don’t have a favorite. I am looking forward to watching Finding Father Christmas. I just bought the book (I’ve been reading pretty much everything Robin Jones Gunn wrote since I was a teenager) and I’m planning to read it before watching the movie though. I also bought the sequel, Kissing Father Christmas, and I’m looking forward to some connected Christmas reading, which is likely only going to happen after Christmas… Just like you, I also find myself amazed at how quickly the year has gone, but unlike you, I am also terrified by how much is yet to happen in this short amount of time until the end of the year. So books on the side, tons of work ahead. Merry Christmas Jessica! God’s blessings as you enjoy family and refresh your life. I also wonder where the year went, but look forward to the New Year and the birth of our granddaughter Seeley Rose mid January. I enjoy most Hallmark movies and have many favorites. Still haven’t decided which one I like this season. It is finally beginning to feel like Christmas in SW Michigan with our normal temperatures and first snowfall. Best wishes. Jessica, sorry you’re leaving us! Praying many blessings for you as you recharge, rest in God, and find new adventures! Thanks for the reading list! My favorite Christmas movies are White Christmas and While You Were Sleeping. Enjoy your family time! Merry Christmas! Jessica, We all will miss you, but we understand the need to spend the time with family. May you find peace and rest during this holiday season. As for Christmas movies and books there are just too many to choose from. My TBR Christmas file grew really big this year and I feel like I’ll never get through it! UGH! I love many Hallmark movies, but I have to limit myself because I can get so caught up in them very quickly and forget EVERYTHING else! Merry Christmas and best wishes as you leave us! My big change coming is a new baby that should arrive in February. So I’m adding motherhood (yay!!) and quitting my job (which on it’s own will be strange). It’s a Wonderful Life is probably my favorite Christmas movie. I love Jimmy Stewart. =) I don’t have the Hallmark channel but enjoy seeing Hallmark movies when I get the chance. There are some fun ones. We will miss you here, but understand. I love Christmas movies and books too. White Christmas is my favorite movie. Wishing you the best! Happy holidays and good luck in 2017! Jessica, sorry you’re taking a break from the blog, but I totally understand! Thanks so much for mentioning my book and our Lone Star Cowboy League series… it’s been great working with you on it. Trixi, if I may add, “A December Bride” was actually based on a book by Denise Hunter. Karen Kingsbury’s “The Bridge” was made into a Hallmark Christmas movie (Part 1 debuted before Christmas–amid some uproar, you might remember, and Part 2 in March, I believe). Jessica, Inspy Romance will miss you. Thanks for all your lovely blog contributions. Blessings. That’s what I meant to say JoAnn :-) Her book made into a movie by Hallmark, sorry for the confusion! Just wanted to give one of our Indiana authors her due credit (Denise Hunter). The Hallmark movies are so much fun! We didn’t have that channel until last year, and so I’ve been stockpiling on all the ones I’ve missed in the past. Makes this season even more fun! Blessings to you and your family this Christmas. 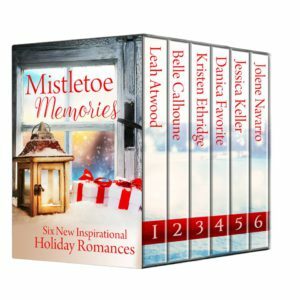 I read my first book of Jessica Keller’s in this Mistletoe Memories set and will enjoy reading more of hers. We don’t have cable, so I can’t watch any Hallmark movies. But each year we do watch Holiday Inn, It’s A Wonderful Life, White Christmas, While You Were Sleeping, The Preacher’s Wife, The Bishop’s Wife, Elf, It Happened On 5th Avenue, Miracle on 34th Street, and others that I can’t remember at the moment. I love all the movies and we have Christmas puzzles that we redo each year. I love Heather Gray’s Nowhere For Christmas, Belle Calhoune’s The Heart of Christmas, Mistletoe Memories set, Frostings & Flurries set. the Christmas Blessings set, and I have at least 6 more Christmas sets and many more Christmas novels to read. Merry Christmas!